← Should high school students planning on the health professions take physics? Does Senator Soto’s proposal on starting salaries for teachers make sense? Senator Darren Soto has filed a bill to raise starting salaries for teachers in Florida’s K-12 schools to $50,000 (story from State Impact Florida here). According to the National Education Association, the average starting teacher salary in Florida in 2012-2013 was $35,166. Does it make sense to raise the starting salary to $50,000 for all teachers? Or should teachers be paid differently according to their subject? 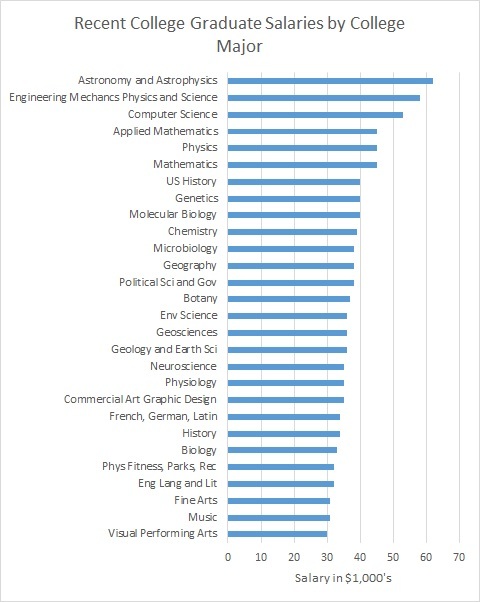 Without further comment, I present a graph of selected salaries for recent college graduates listed by FiveThirtyEight.com and taken from the American Community Survey. 3 Responses to Does Senator Soto’s proposal on starting salaries for teachers make sense?